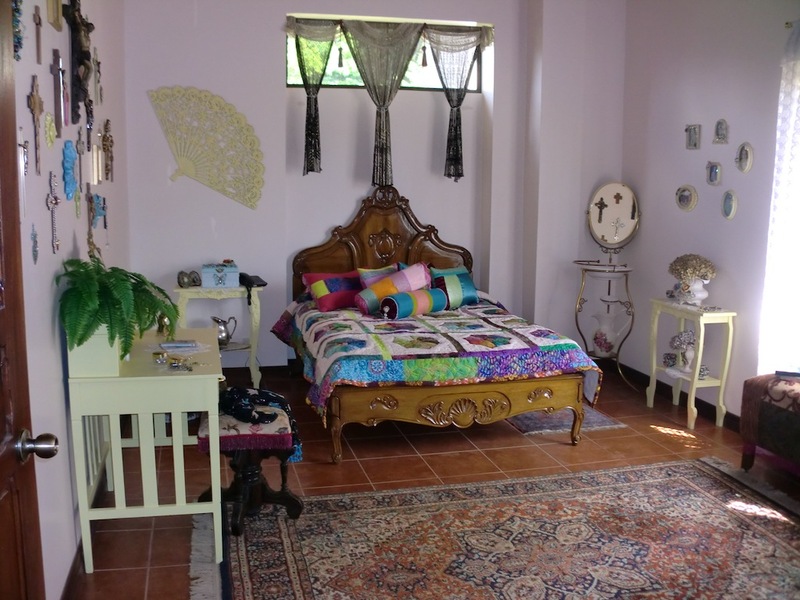 It’s no secret that when it comes to decorating, I am a major fan of all things Bohemian. According to Rebecca Purcell’s book Interior Alchemy, my decorating style is “exotic”. Ok, I’ll go with that. I love color and texture and bold patterns. And most of all, I love things from far away lands especially if they have history. 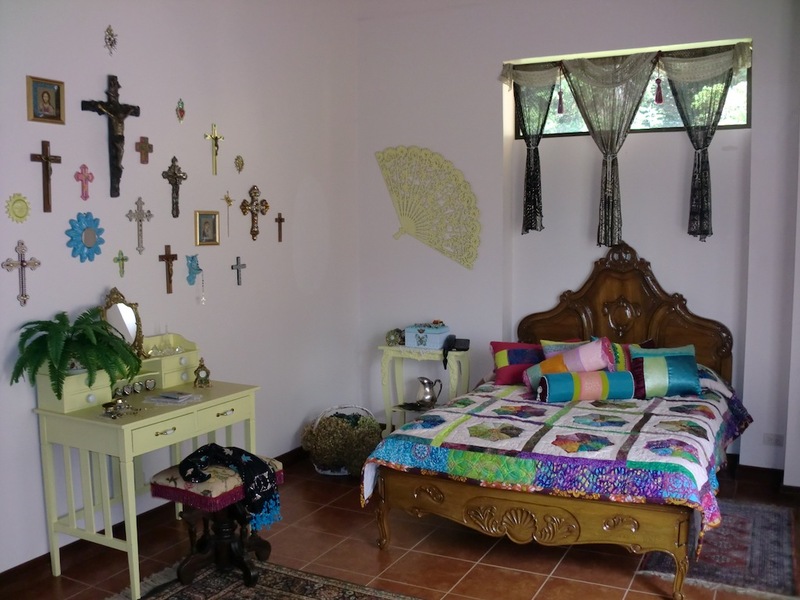 That’s why when I began to think about a window treatment for a long horizontal window located right above my bed I knew that I wanted something different. I couldn’t bear the thought of more white lace curtains. I tried several things on the window, from beads to fringed piano shawls, to pieces of brightly colored habotai silk that I had dyed myself, but I wasn’t happy with the way any of them looked. 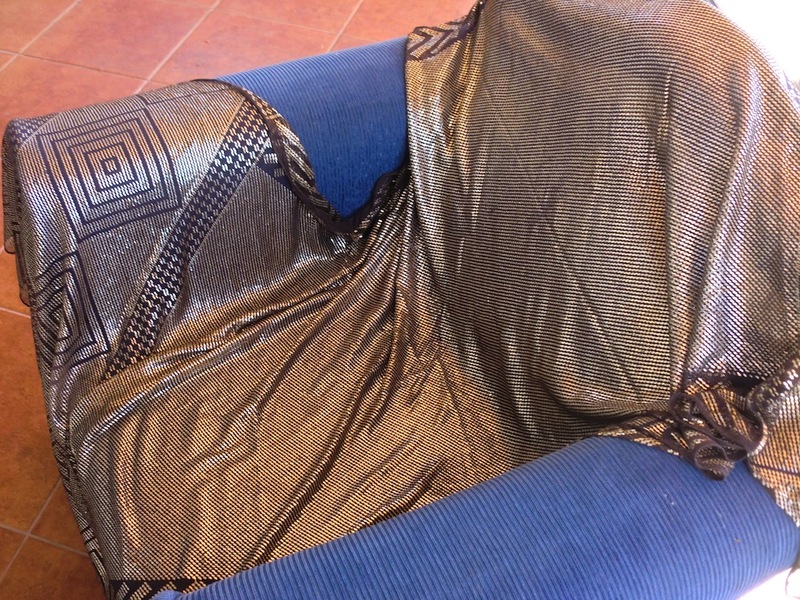 Then I thought of the pieces of antique Assuit fabric that I had stored away in plastic bags. For those not familiar with Assuit fabric (pronounced ASYOOT) it is a wonderful textile that has been made in Egypt purportedly since the days of the pharaohs. It’s actually made of real silver which is carefully woven into a cotton mesh fabric by hand with a flat two eyed needle. Each “stitch” is made individually by using a long strip of wirelike silver thread which is looped into the mesh several times forming a little bundle and then its cut and crimped tightly by the artisan’s fingers. The designs are typically geometric or figural. The finished product shimmers and shines like liquid silver and it’s beauty defies description. Assuit fabric (also known as tulle bitelli) gained popularity in the west with the discovery of Tutankhamon’s tomb in 1922 when everything Egyptian became fashionable. Thousands of assuit shawls were exported and they became a favorite with flappers who wore them as elegant evening shawls. 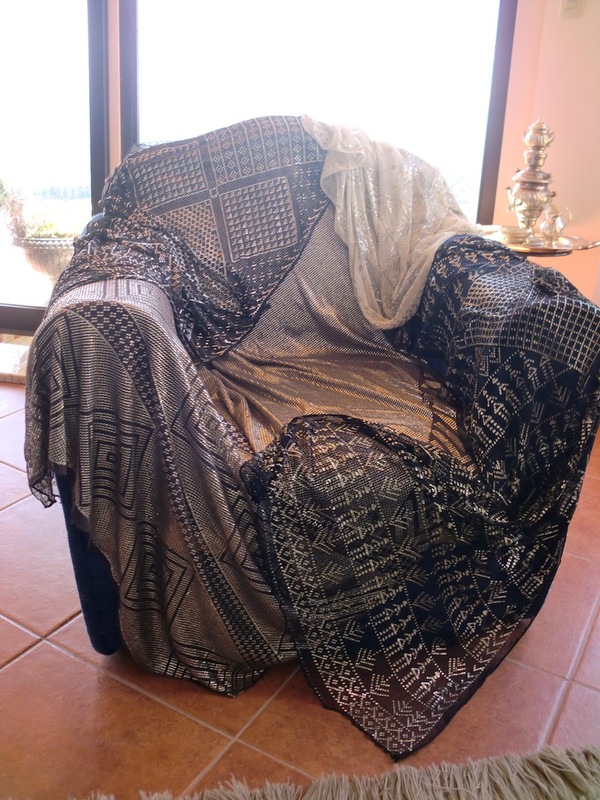 They are actually known as Art Deco shawls in many places. Hollywood jumped on the bandwagon and many movie star’s costumes during the golden days of Hollywood were made of beautiful quality heavy Assuit. Heddy Lamarr wears an assuit costume in the film Samson and Delilah. It’s still made today in Egypt but the quality of modern pieces can’t compare to the workmanship of the antique Art Deco pieces. The difference is also reflected in the price. 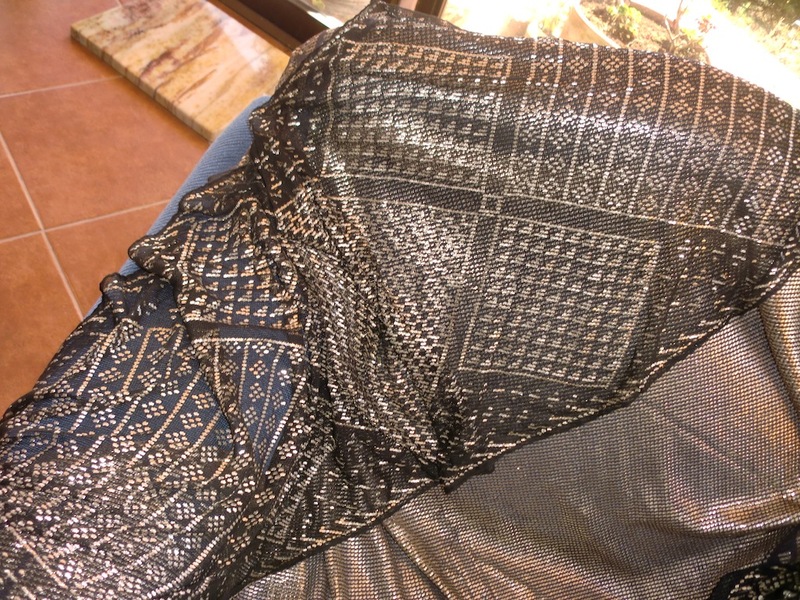 While a modern piece of Assuit textile measuring approximately 25 inches wide and two yards long can sell on Ebay for as little as $40 dollars, an antique piece of the same size typically goes for 250 to 350 dollars or more, depending on the condition and the amount of silver that was woven into the fabric. The more silver, the heavier the shawl. Modern pieces come in many colors of mesh backing, but the antique pieces were typically made on black, ivory or brown mesh. Thrift shops are a good source of antique Assuit, mostly because alot of people don’t know what it is or what it’s worth. I bought this antique piece on Ebay for less than 100 dollars a few years ago from someone who listed it as a tablecloth. It weighs two pounds. A piece like this typically sells for $700 to $1200 dollars on Ebay. I’ve been able to find several beautiful heavy pieces of antique Assuit fabric on Ebay over the years, some for myself and some for my mother. She displays hers as piano shawls. Mine have been stored in plastic bags for far too long though. What’s the use of having them if I can’t enjoy looking at them? I figured it was high time to display them. 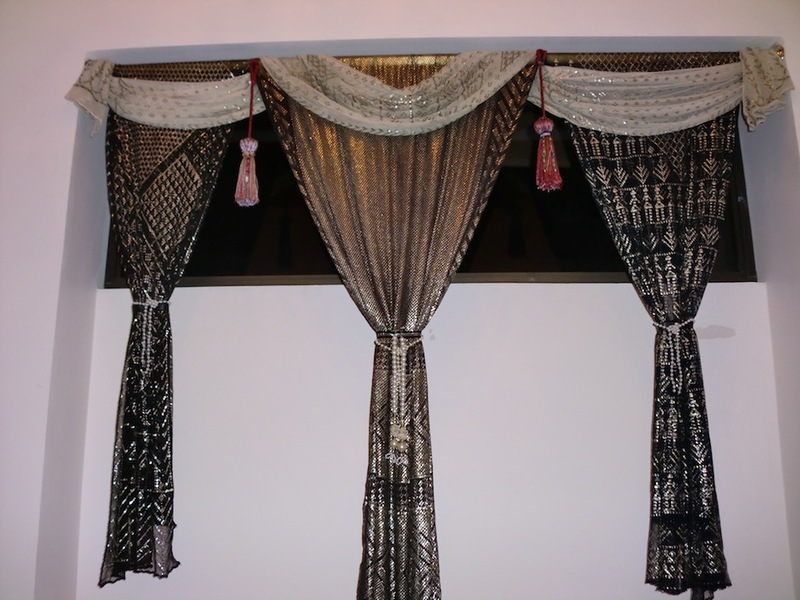 Here are the four pieces that I used for the curtains. The heavy one in the middle is on a brown mesh backing. One is ivory and the other two are black. Since the window above my bed doesn’t get any direct sunlight there isn’t much danger of the fabric being damaged. 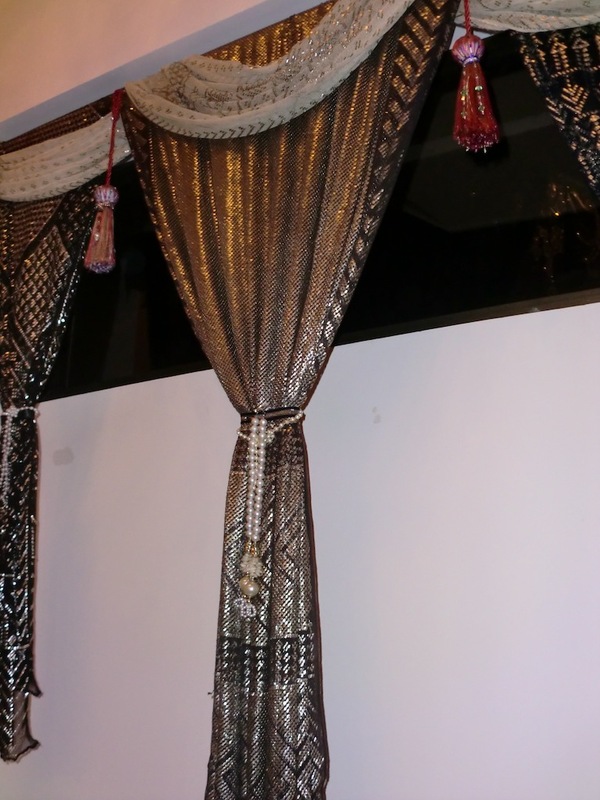 I didn’t have the heart to cut them so I just draped the assuit over the curtain rod and tied them all in the middle. 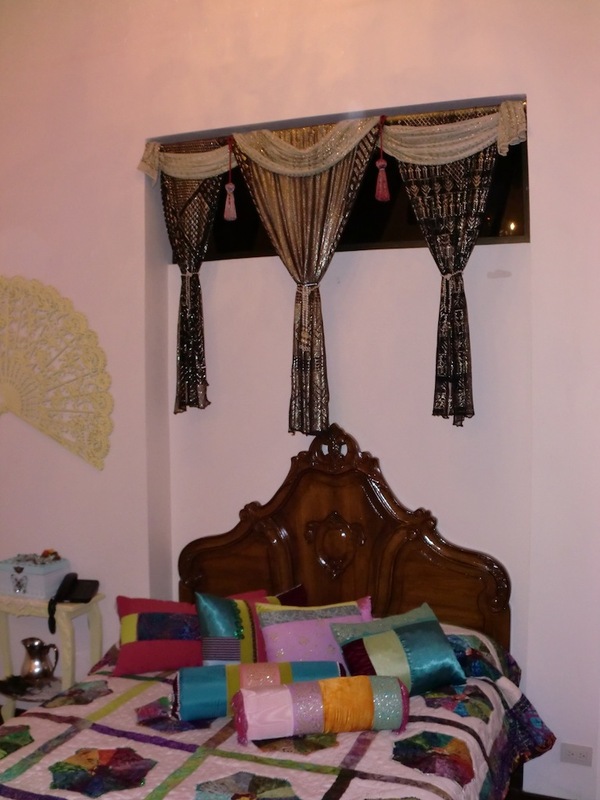 An antique ivory colored assuit shawl doubles as a valance. They are sheer enough to let the light in during the day, but the real beauty of this fabric can be admired best at night when the light from the chandeliers hits them. The liquidlike shimmer is almost blinding. But I’m not done yet. 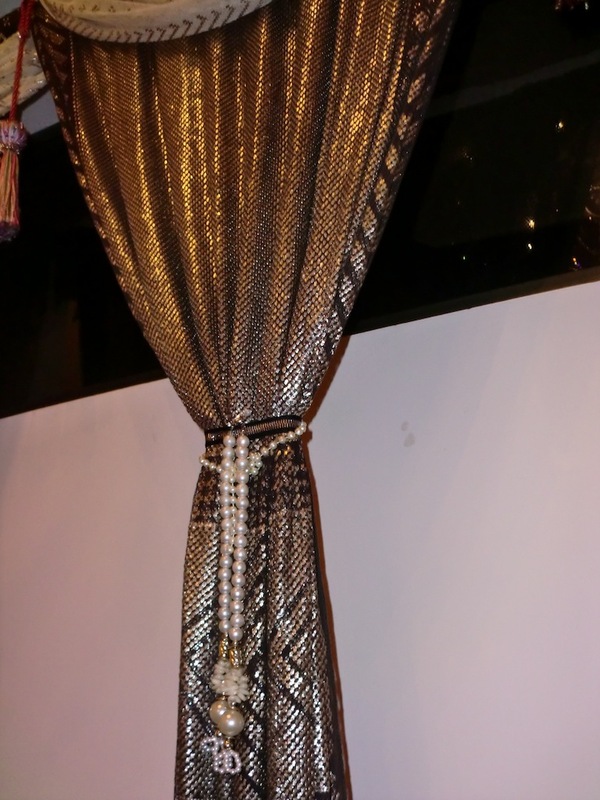 I’m thinking of adding strands of creamy pearl swags and more jeweled tassels…and maybe a few crystals. 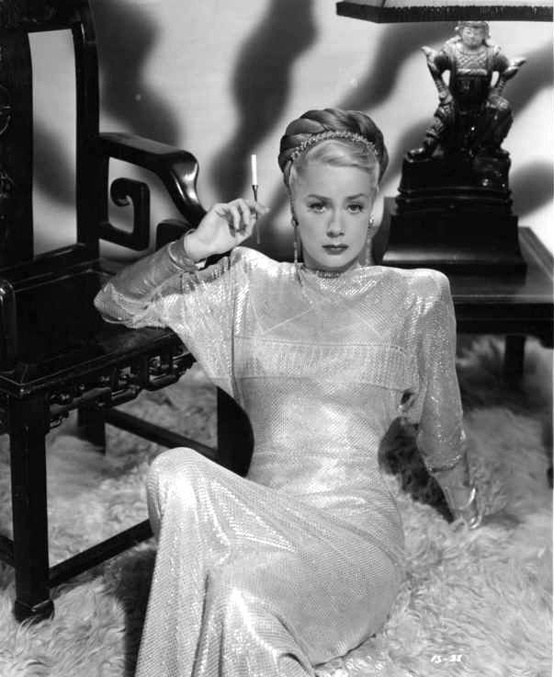 Here’s the beautiful June Havoc (Gypsy Rose Lee’s sister) in a stunning ivory colored assuit evening gown.